Sapphire Soap Rocks...a gemstone symbolizing loyalty. Soap Rocks are made from unique blends of whole herb extracts, vitamins, & minerals. 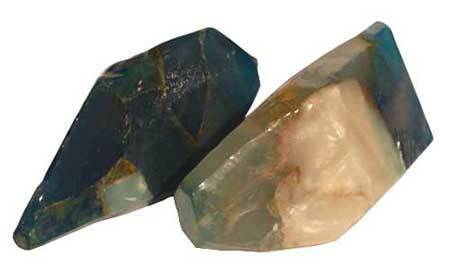 Sapphire Soap Rocks are very mild & extra long-lasting. Soap Rocks are gentle for sensitive skin, contain no animal products, & are tested on humans. "In form & function Soap Rocks are dedicated to our skin, our spirit, & our earth." Scent: Starry Night (Cool Fresh Air). Size: Sapphire Soap Rocks have variations in size, shape & color. Each Soap Rock weighs approximately 6 oz.